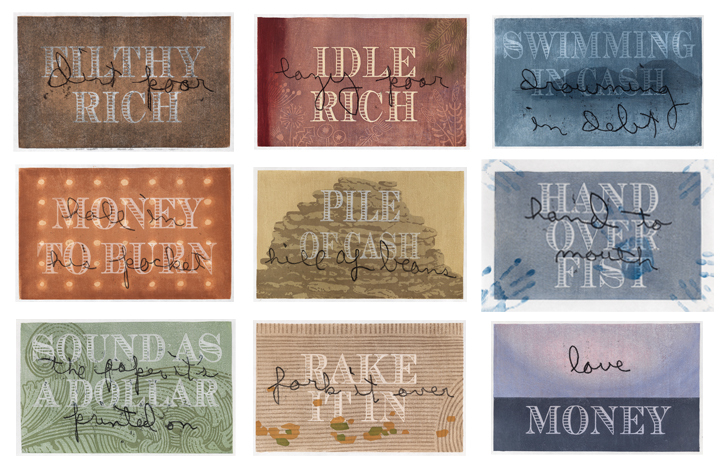 Here are all nine of the “Mixed Feelings” prints. I can't wait to see them all together on the wall at Cullom Gallery next month for the opening of my solo show there. The week before last, in advance of that show, I brought the prints to my friend Stephen Petegorsky to have photos taken. In addition to his own fine art photography, Stephen is known for his work photographing art for area museums and artists, and he provides beautiful, well-lit, high resolution digital images that can satisfy any need that comes up -- gallery show materials, web site use, etc. Although it can be pricey to have artwork professionally photographed, I find it to be well worth the money. I've often used words in my art, even before this “Loaded” series. But in working with the topic of money, I realized that words and money have some things in common. Both are vehicles for moving inner mental pictures from the realm of dream/idea to objective reality. And both are things we take for granted, that we use on a daily basis, and that we often don't examine closely. Words matter. How we phrase things reveals much about our inner state and our beliefs. As I looked at some of our cliches about money, I was stunned to find them so full of ambiguity and almost a kind of anguish. We love money, we hate money. Money is cool like water, money is hot like fire. Money is precious, money is dirty. In these overused phrases we can see our values and beliefs about money, wealth, and poverty. These are our stated beliefs -- we state them every day, with barely any thought. Are these really the beliefs we want to have? 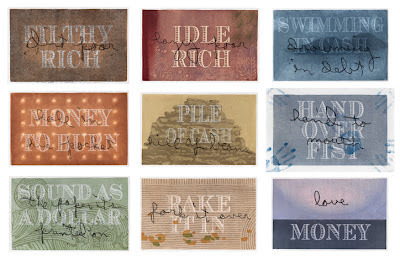 Here's the last print in the "Mixed Feelings" group, and also the last print in the whole Loaded series about money. It was fitting and poignant for me that my last act in making this print was to trace my beloved father's handwriting: to reproduce the word love just as he wrote it in a letter he sent me 35 years ago. My dad always told me that the way to be successful in my work life was to "work the system." That's what worked for him, and the system supported him well, from the GI Bill to a life of state-level public service that left him with a nice pension for his retirement. But I've always been self-employed or half-employed, too much outside of the system to "work it." And at this point is there even a system left to work? The topic of this series has put me face to face with the consequences of my own decisions about work -- my decision to stop putting energy into my career as a commercial artist and to devote myself to fine art. The economic consequences of this have been huge for me. Maybe I'll write more about that later, but suffice it to say that I now earn about 15% of what I was able to earn as a commercial artist. On the other hand, I'm about 90% happier. I think it's something of an artificial choice, this love or money question. The two aren't necessarily related -- you love what you love whether you're rich or poor. Love is air, and money is water. But there's a surface tension between the two. You can HAVE what you love a lot easier if you're rich than if you're poor. I have the freedom to choose a life where I earn 15% of what I used to earn because I had 20 years of earning so much more. Lynn & I chose to sock that money away, pay down all our debt, and downsize our lives, which allows me to now choose to be a full-time artist. During the 13 months I've worked on the Loaded series I've doubled down on that commitment to myself. But I've swallowed hard in doing so. Gone are any illusions that I can get rich this way. Thank you for following the progress of this work. This is the eighth in a nine-print series examining figures of speech about money that use the same metaphor for both wealth and poverty. Sometimes it's fun to visually remember that I work with a Japanese method of printmaking. When I thought of raking, I thought of the lovely raked gravel temple gardens I saw in Kyoto at the Mokuhanga Conference last summer. Rakes and forks both have prongs that grab things. The prongs on forks (including pitch forks) are called tines. The prongs on rakes are called teeth. English is a funny language. Happy August! 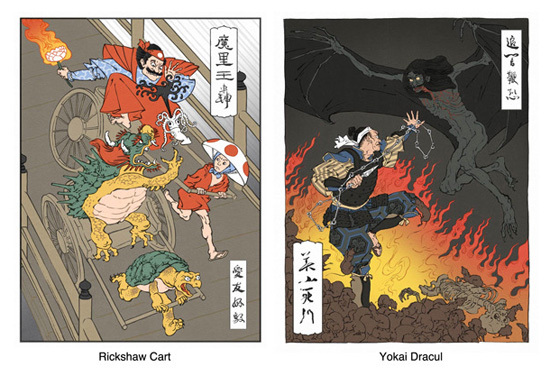 An announcement in my daily Baren Forum Digest tells me that a Kickstarter* opened this morning for a new collaborative project between American illustrator Jed Henry and Tokyo-based woodblock printmaker David Bull called “Ukiyo-e Heroes.” The series re-contextualizes video game characters into the old Ukiyo-e style. The digital designs have been completed -- this kickstarter seeks to finance the production of actual woodblock prints in Dave's Tokyo studio. Here's the link if you want to get in on it.